HOME LUNAR PROPERTY LISTINGS WHO OWNS THE MOON? Who Really Owns The Moon? We receive inquiries occasionally from people who wonder how we can "sell the Moon" when someone else actually owns it. Often, people incorrectly believe that these ownership claims are true simply because they saw a report on television about a person or business selling Lunar property. Be honest: do you seriously believe that one man owns every planet in the Solar System? These claims are, sadly, false. No single person owns the Moon, regardless of whether that person sent a letter to the President of the United States or the Secretary-General of the United Nations. And just because the U.S. or U.N. never responded to this person's letter, that does not mean that he automatically became the owner of the Moon and the other planets. Check with any attorney and they'll confirm for you that this isn't the way the law works in any country on Earth. In fact, Dennis Hope of the Lunar Embassy has fabricated a fictional tale in which a vision came to him, and led him to register a claim to owning the Moon in 1980. He claims to have filed a document with "his local US Governmental Office for claim registries," an entity that simply does not exist. To this date, Hope has not been able to produce the original document that he purports to have registered; instead, he offers a poorly-worded page that he made up on his home computer several years after the fact. Wouldn't you think that — if the original document existed — it would be one of the most important documents in history? Hope also conveniently ignores the fact that numerous other entities made claims to "moon ownership" prior to his supposed filing — and all equally as bogus. A claim by a lawyer from Chile was published in his nation's public record in 1953 and was noted by the President of the United States during the Apollo 11 landing in 1969. In 1955, Robert R. Coles, chairman of New York's legendary Hayden Planetarium, announced that the Moon was his own and sold thousands of parcels for one dollar per acre to benefit the facility. In 1966, the Geneva town council in Ohio signed and ratified its own "Declaration of Lunar Ownership." In addition, Hope states — also incorrectly — that the so-called United Nations Outer Space Treaty failed to mention anything about private individuals or corporations owning celestial bodies, and that this "legal loophole" is the basis for his claim's legitimacy. You may read the entire text of the treaty on the United Nations website. Q: Can any State claim a part of outer space as its own? A: No. The Outer Space Treaty states that outer space, including the Moon and other celestial bodies is not subject to national appropriation by claim of sovereignty, by means of use or occupation, or by any other means. The Treaty establishes the exploration and use of outer space as the "province of all mankind." The Moon Agreement expands on these provisions by stating that neither the surface nor the subsurface of the Moon, nor any part thereof, or natural resources in place, shall become property of any State, international intergovernmental or non-governmental organization, national organization or non-governmental entity or of any natural person. The legal definition of "natural person" is an "individual human being." The person we are referring to here as the "owner of the Moon" is a "natural person." Additionally, this person repeats another falsehood: that the 1979 U.N. Moon Agreement failed to win the necessary votes to become ratified as law. "Theres just one small, minor problem: Of all the approximately 185 member states of the UN only six states supported it. All others, including all spacefaring nations (USA, Russia, China etc) refused to sign it and did not sign it. That is something that does not seem to be well known. The USA explicitly refused to sign it as it would inhibit the exploitation of Lunar and other celestial resources for profit by corporations and individuals. Some websites actually incorrectly list the Moon Treaty as ratified. (Far more worrying...this includes Nasas own, published archives.)" Not well known? The reason that this "is something that does not seem to be well known" is because this person is WRONG! The reason that websites, including "NASA's own," claim that the 1979 Moon Agreement was ratified is because it was ratified — by consensus of ALL UNITED NATIONS MEMBER-STATES. It received the required number of ratifications and has indeed been in force since 11 July 1984. The reason that NASA's website lists this agreement as having been ratified is the same reason that the U.N.'s website lists it: BECAUSE IT HAS BEEN RATIFIED AND IT IS THE LAW. If you don't believe us, check with the United Nations. If you don't believe them, check with the International Institute of Space Law (IISL) in Vienna; the president of IISL, Dr. Nandasiri Jasentuliyana, is the former Deputy Director-General of the United Nations Office at Vienna and served as Director of the U.N. Office for Outer Space Affairs, overseeing the implementation of both the 1967 and 1979 treaties. Don't be fooled by novelty deeds. That's our source for the law. What is Dennis Hope's source? He may have appeared on television, radio and in newspaper articles that take a light-hearted look at his claim. But those programs and articles usually also quote space law experts who explain that the "deeds" he sells are merely a novelty and that no basis exists in law to legitimize his claim. It should be noted that, for nearly two decades, the so-called "deeds" sold by this person included a very prominent disclaimer advising the buyer that he or she had purchased a "novelty gift." 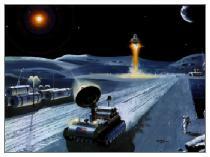 Luna Society International, a publicly registered International Business Company, offers land claims to selected properties on the Moon in compliance with the Lunar Settlement Initiative, under which at least 95% of all funds raised must go directly to support a privatized program for settlement and development of the Moon. We don't claim to own the Moon; no nation or government owns the land within its borders. Instead, laws and treaties are created that allow for the orderly distribution of property. We are offering a legal means for private citizens and commercial enterprises to purchase Lunar real estate, along with a realistic program for the eventual settlement and development of that property. On a daily basis, we are contributing to the goal of returning humans to the Moon. We are proud of the work we are doing and of the achievements we have had so far. The Society has developed the most comprehensive interactive atlas of the Moon ever released to the public (www.FullMoonAtlas.com); successfully advocated the removal of a crater designated for a Nazi war criminal; provides financial and administrative resources to organizations that are helping us to reach our goals; annually provides scholarship opportunities to students seeking advanced education in aerospace-related fields; and launched the largest in-classroom Lunar education program ever undertaken for elementary-school students. Focused on getting youngsters interested in space exploration and the Universe around us, this program will culminate with a competition that will send the winner of a nationwide essay contest to Space Camp in Huntsville, Alabama (USA).